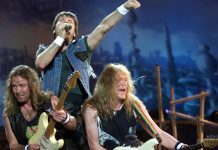 Caught Somewhere In Time by Iron Maiden is the opening track from Somewhere in Time, the sixth studio album by Iron Maiden, released on 29 September 1986. 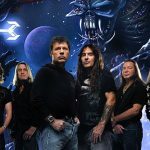 Somewhere in Time is the band’s first studio effort following the extensive World Slavery Tour of 1984–85, which was physically draining for the group, lasting 331 days and comprising 187 concerts. 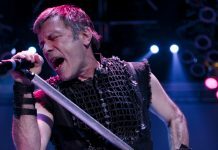 The resulting exhaustion is credited as the main factor in the complete lack of songwriting contributions from lead vocalist Bruce Dickinson, whose material was rejected by the rest of the band. 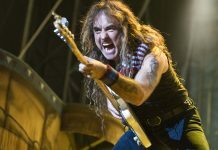 Dickinson had written several “acoustic-based” songs, explaining that “I felt we had to come up with our Physical Graffiti or Led Zeppelin IV … we had to get it onto another level or we’d stagnate and drift away”, although bassist and primary writer Steve Harris “thought he’d lost the plot completely”, surmising that “he was probably more burnt out than anyone at the end of that last tour”. 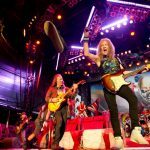 On the other hand, the record is also notable for the number of “fully formed” songs written by guitarist Adrian Smith, who wrote both of the album’s singles: “Wasted Years” and “Stranger in a Strange Land”, the former of which is the only song on the record not to feature synthesizers. Since its release, the album has been certified platinum by the RIAA, having sold over one million copies in the US. 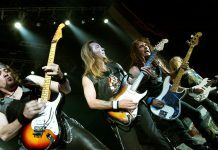 Following the World Slavery Tour, the group were given four months to recuperate, with Harris, Smith and guitarist Dave Murray spending the time experimenting with new equipment. 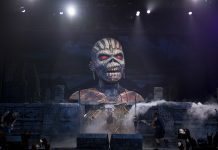 The result was a marked change in sound for Iron Maiden, as it was their first to use guitar synthesisers, although on their next release, 1988’s Seventh Son of a Seventh Son, the effects were provided by keyboards instead. 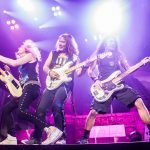 Given their time off, this was their first studio album not to be released a year after their previous one, the band insisting that they have more time “to get it right without hurrying for a change”, comments Harris. 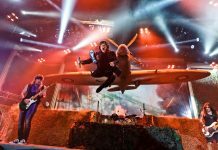 It was also one of their most expensive records, with the bass and drums recorded in the Bahamas, the guitars and vocals recorded in The Netherlands and the mixing taking place in New York. The guitar solo and tablature can be found in my Premium channel along with many more in depth lessons not available on YouTube for only $6.99 a month. 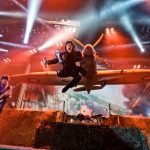 Another great easy to follow Iron Maiden Guitar Lesson.